 Return of a favorite An Argentine-grown, California-finished $10 red has arrived in a new vintage, and we're glad. The new vintage is big and bold, no fruit bomb but a concentrated, ripe but well-balanced wine made from ripe fruit after a long, warm summer. I'll be in Verona, Italy, for most of the rest of this month, judging at the Vinitaly wine expo and traveling the Veneto wine roads. Accordingly, there'll be no Wednesday or Friday Wine Advisor editions or Thursday FoodLetters next week or the week after. I plan to publish the Monday edition as usual, and normal daily publication will resume the week of April 2. Let's wrap up the week with a quick report on a newly arrived vintage of an old, affordable favorite that spans the equator from Argentina, where the grapes are grown, to Sonoma County in Northern California, where the wine is finished and bottled by its American wine maker. This North-South treat is Terra Rosa 2004 Mendoza Old Vine Malbec from Laurel Glen. 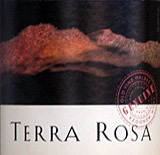 As we've discussed here on occasion before (I told you it was a favorite), Terra Rosa began life as a California wine, but moved its base of operations to Chile when price inflation in California wine grapes made it impractical for Laurel Glen wine maker Patrick Campbell to continue making a modest wine that met his standards and that could be sold for $10. More recently, Campbell's South American base of operations crossed over the Andes from Chile to Argentina, where he produces a variety of wines including the still-affordable, still splendid Terra Rosa, which this year adds a splash of 10 percent Argentine-grown Tempranillo, the Spanish grape of Rioja, to add spice to the Malbec. The two-country wine-making process works like this: The grapes are harvested, crushed and fermented in Argentina, then put into 24,000-liter stainless steel containers for ocean shipment to California under temperature-controlled conditions. Upon arrival at Laurel Glen's contract wine-making facilities in Graton, Calif., it's aged in French and European oak barrels for 15 months. The 2004 vintage remains affordable, priced at $10.99 at the winery and at some retailers for a little less. It's a big and bold wine this year, not a fruit bomb but a concentrated, ripe but well-balanced wine made from ripe fruit after a long, warm Mendoza summer. It's worth seeking out. FOOD MATCH: Pan-seared duck breast medallions make a fine alternative to its obvious pairing, rare char-grilled steak. VALUE: This hearty red is just about a sure bet to make my Top Value list for 2007. WHEN TO DRINK: Although it's meant for early enjoyment, I think the combination of fruit, balance and palatable tannins under a sturdy modern screw cap suggest that this wine will hold well for a few years in the cellar or on the wine rack. Check prices and find vendors for Terra Rosa on Wine-Searcher.com. What wine lover hasn't dreamed of touring this great wine region, meeting its wine makers, learning about its wines and dining in its characteristic restaurants and bistrots? Burgundy is one of the world's greatest wine regions but also one of the most difficult to learn. Its patchwork of tiny vineyards is intriguing, but almost bewilderingly complicated. There's no better way to learn Burgundy than being there, touring the wine roads, visiting historic producers like the pictured Clos de Vougeot, and tasting with a trusted guide.